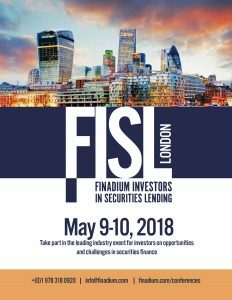 During a panel discussion at FISL NYC, participants gave a prediction on the future of securities lending. CCPs came out on top as a market infrastructure that will lead the way, but the pace of adoption is slow enough to cause frustration. It’s a topic that splits the buy- and sell-sides considerably. Dealers are looking for balance sheet netting opportunities across all of their trading books and CCPs are able to capture that, said Gareth Jones, COO at DTCC Euroclear Global Collateral, who was also a moderator on the FISL NYC panel. In the US, OCC, a securities lending CCP, is seeing increased volumes, and a lot of that activity is dealer to dealer business. Over the last five years, OCC went from about 408k new loan transactions in April 2013 year-to-date with an average daily loan value of some $48.8 billion in March to about 916k new loan transactions in 2018 with an average daily loan value of $183.5 billion in April. CCPs are also the lowest risk counterparties. But when it comes to beneficial owners, how CCPs can advance remains in question. Matthew Chessum, Investment Manager at Aberdeen Standard Investments, based in the UK, said that “it’s like Groundhog Day with CCPs”.